Editor’s Note: This post first appeared on OpenView’s new Medium publication, Expand Upon. Be sure to follow us on Medium here. tl;dr — pure freemium has a low ceiling in B2B, but high-touch sales is expensive; combining the two motions to efficiently sell to free users could be your team’s next breakthrough. Playbooks for SaaS demand generation, predictable revenue and customer success are becoming widely known and implemented. Companies that have mastered these fundamentals of inside-sales-driven SaaS distribution find themselves in search of step-function improvements to unit economics. Ultra high growth organizations constantly seek ways to expand reach and awareness, and to turn that demand into happy customers that refer friends and coworkers. In search of step-function improvements we look to the nature of the acquisition funnel itself to find blockages; what steps and flows for buying and adopting the product can we fundamentally rethink? A typical SaaS product sold through inside sales centers on the notion of the Marketing Qualified Lead or MQL. The MQL lives as a CRM record, a conversation that started through outreach from a sales rep (SDR, most likely) or converted on a landing page. Along the way in order to become marketing qualified the individual met various criteria, including but not limited to demographic characteristics as well as a behavioral profile that suggested the person could be a good fit for the product. Here the dance begins, often including a trial, demo(s), and even consultative sessions with sales. Following these meetings the buyer negotiates a contract, purchases the product, receives full access to the product, often begins product training, potentially a data migration and/or other technical setup … and at some point becomes a happy user of the product. Traditional inside sales-driven distribution starts with the fit and sale, with customer success becoming the focus post-sale. What if we could sell to folks who were already getting value? The breakthrough moment for us on the HubSpot Sales products was when we started thinking of our (amazing) sales team as a “Revenue API” for the product; wherever we could develop a product that would sell itself … we did that, and where the product team needed help converting users to customers we generated leads rotating them to sales. Enter the Product Qualified Lead, or PQL. If we flip the traditional model 180 degrees and start instead with product adoption, we find ourselves selling the product to folks who understand the offering and are potentially already happy with it, before they even pay. To many this may sound like freemium. I would argue that freemium fell short in B2B and from its ashes rose the PQL. 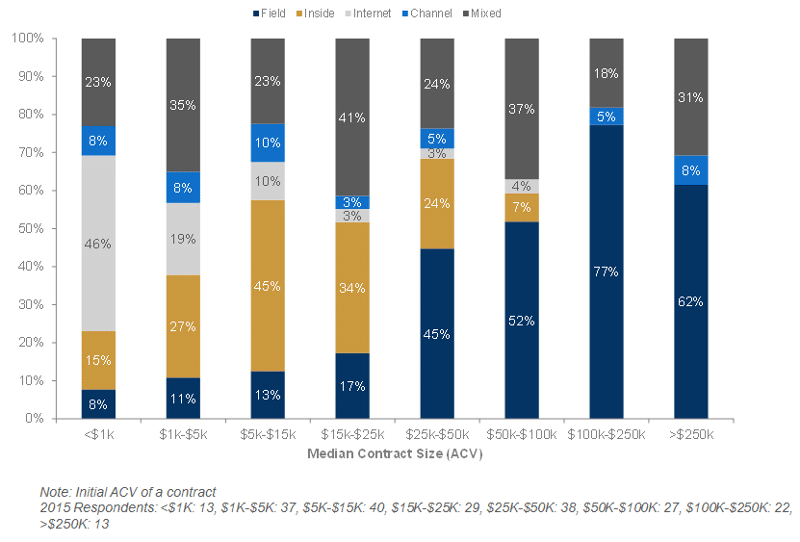 While “pure” freemium businesses (which I would define as having zero touches during the sales process) may work well in the consumer product world, B2B products hit a growth ceiling that often can only be broken through by using a higher-touch sales model. The graph above tells the story behind the shift from pure freemium in B2B toward the PQL model. Touchless sales loses its effectiveness as deal size increases. Mixing the velocity of freemium with the higher pricepoints of inside sales can be magical. 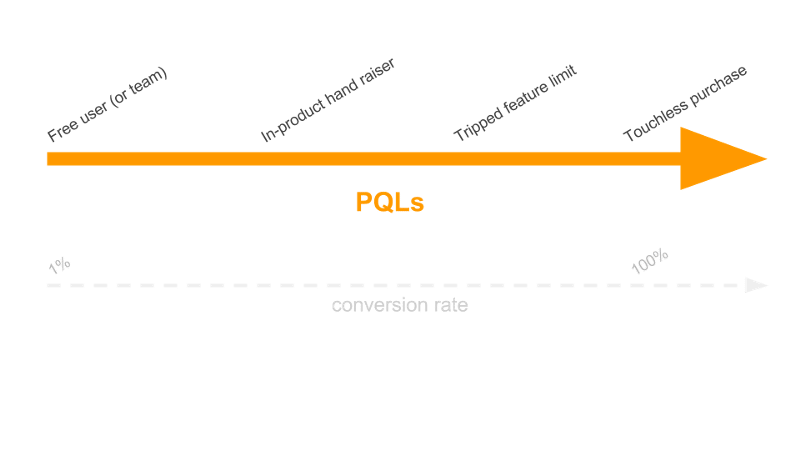 To understand the product qualified lead, it helps to see the various flavors of a PQL and how they fall neatly across a spectrum. On the far right of this spectrum are touchless self-service purchases — we consider these PQLs because in some models it makes sense to encourage a (usually small) starting purchase and then for the sales team to call into those new customers to ensure success and account expansion. Since they are purchases they have a conversion rate of 100%. As we move back through the spectrum we see that there are leads who have hit some capacity limit, for example they might have used all the calling minutes allowed on the free plan. The conversion rate of these leads will vary but in some cases it can surpass 50%. This outstanding conversion rate makes sense considering these are users who have already onboarded and adopted the paid product in its free version; there is little to explain or demo here for the rep, so they can focus on closing business and positioning the customer for longer-term success. The challenge here is getting free users this far down the engagement path. This type of PQL carries some caveats and details that are worth exploring. Even if users have deeply engaged with a subset of features, even exceeding a capacity limit, the sales conversation still adds value beyond the original point of adoption. For example there may be features that the user cannot access for free and for those sales still needs to attach the solution to need and to qualify properly. Additionally it is common for users to use one feature very deeply and know they need to upgrade, but fail to fully attach that particular feature to lasting value. In these cases, it is important to run a good needs-based discovery and recommend how the larger offering can be a long-term solution. Another click back brings us to “hand raisers”, ie. users that generally have a preference for someone to help them connect the dots. This type of PQL looks a lot like an MQL from a systems perspective since it is typically generated from a form submission. The difference is that instead of filling the form out in exchange for gaining access to gated content the user is instead requesting to learn more about a feature they have stumbled across in the context of using the product. This approach works well in two situations: a) when there is no path for a valuable free version (cost-prohibitive or impossible from a compliance perspective) and b) when the feature requires positioning and/or explanation. Hand-raisers can convert at 2x-4x the conversion rate of traditional MQLs. Finally we have free users, who in certain circumstances can be thought of as PQLs, perhaps when they meet certain behavioral or demographic criteria. Constant Contact famously tripled their trial conversion by calling free users, and that same pattern can yield great results. The word of caution here is to be targeted about who you call, and to keep in mind the challenge of calling someone who is not expecting a call. One trick here is to do some personal email nurturing for those free users with whom your team would like to connect. 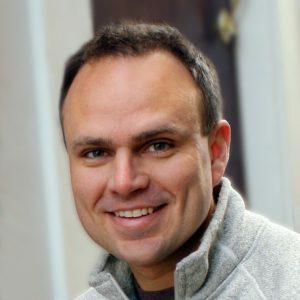 A particularly powerful pro tip from PQL sales guru Michael Pici: Have all email come from the assigned sales rep have the call-to-action be for the rep to offer setup help and product guidance. The conversion rate for free users will vary wildly based on your model, but typically will be in the low single-digit percents. It may seem daunting to overhaul your sales motion, whether it is working for you or not! One easy way to start to dabble with product led demand generation is to have landing pages that describe feature functionality, and to link to those pages from your product’s free trial. You likely have the infrastructure in place to rotate a form submission to your sales team, so this is a lightweight starting option. From there you’ll need the collaboration of your product and sales team to drive more free-product engagement and move that “PQL point” further into the adoption cycle. Good luck out there and if you try some of these ideas we’d love to hear your thoughts and results! Thanks to Michael Pici and Brian Halligan for the brainstorm that produced the PQL spectrum.